Okay it is time to carry on with telling you everything about the mystery game! I am a bit behind but I will catch up in this episode. One thing I didn’t tell you was when I make games I don’t really follow a development pattern or system, I just do it and keep adding features as I need them. Because it is just me by myself making this game I don’t need to follow a system. Anyways I started by sketching out what I wanted the character to look like so I could make him with animations, so I could make the character controller first. 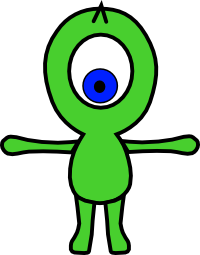 Here is the basic modelling I did for a low poly alien dude, note there will be no materials or textures until after the game is tested and working. I then decided the rig was too simple and needed to be ramped up, so I made the whole thing again! Now with IK (inverse kinematics) constraints. 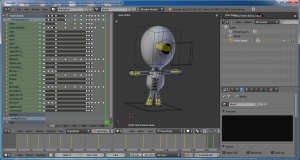 The yellow bones are IK bones and are controlled by moving around the hand causing the arm to bend automatically in a realistic way. 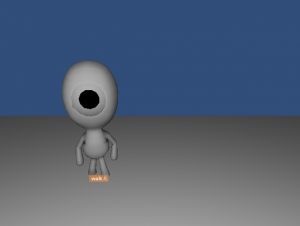 I then started animating the character, making things like the walk cycle, the idle cycle (when Fred is standing around) and the jumping animation. This is the dope sheet for the animation. 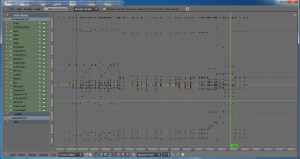 Each little dot represents a keyframe for each bone. This is the animation graph. It looks a bit complicated but its really simple, each line represent the position of each bone over time. The smoother the curve, the smoother the animation! 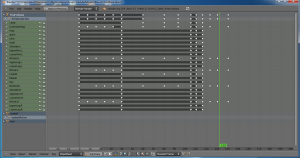 After doing this I started to bring in all this data into the Unity engine. To save time and my brain power I decide to use PlayMaker for this project. 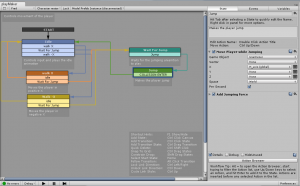 It is an extension to the Unity editor for doing visual scripting. After much thought this is the character controller I made using PlayMaker, I colour coded everything and labeled eveything so it is much easier to read. Then I did some testing and it worked! 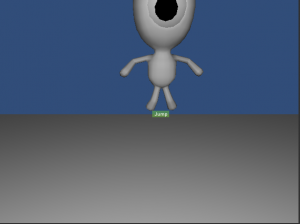 Here are some pictures of Fred moving around and animating in Unity. If I get around to it I will make a video of the character controller so you can really see it working. That’s it for today! I am not telling you much about what you do in the game as I am going to let you figure it out by reading the series and helping me make changes along the way! Thanks for reading and don’t forget to come back! I do really apologise for my lack of activity the last week. Life can been busy at times as many of you know. I am back now and I am going to make a valiant effort to put up a post every couple of nights. This is the important bit, I often don’t put up posts because I have not been doing any game making and so I have nothing to put up. If I haven’t posted in a day or two and I have nothing to post I am just going to post stuff relating to games in general. This will keep the site active and hopefully interesting. I have wrapped up Dead Lep Revenge finally. It really didn’t go to plan but I will learn from it and hopefully make better games in the future! This winners of the competition will get to play it first and everyone else about a week later. With regards to the mystery game I have been doing some work on it and will put a post continuing my “how I make games” series tomorrow, for now here’s some concept art I did in Inkscape. Thanks for reading and be sure to come back! I do think it is time, but first; as I have told you in my last post I am constantly learning new things and new ways of making games and my recent discovery was Inkscape. It is a free, open source vector graphics software and an alternative to Adobe Illustrator. I have been playing with it and learning how to use it and it is amazing. 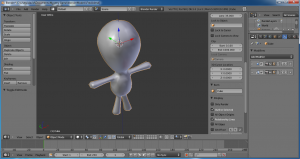 I am going to use it, along with Blender to make 2d games from now on. 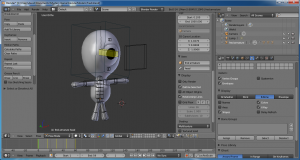 People familiar with Blender know it is a 3D modelling and animation software, like Maya but free, and yes I said I was going to use it for 2D animation. I did some experiments on it over the weekend and found it is great for 2D animation as well. Now on to the Mystery Game! After Dead Lep Revenge not quite working out exactly right I decided to make a smaller simpler game with fun addictive gameplay. This is were the mystery game came from. I have only been working on a prototype for a week now it is very new and fantastic but still. In the game there is a randomly generated level with platforms. You start at the top and have to get to prize at the bottom and bring it to the top. There is however guards in the way that will stop you. You will have no weapons so its purely a strategy and puzzle game! Tell me what you think, oh and it doesn’t actually have a name yet so this is were you come in. Leave your name suggestions in the comments or send me a tweet and hopefully we can find a cool name! Thanks for reading! A few weeks ago I spoke about tutorials. Well this is what I have come up with! Its not really a tutorial but more of a deeper look into what goes on behind the scenes of game development. As I have said I am not a professional game developer and some of my methods may not be exactly the same as a big game studio. Basically what will happen is I will document everything I do in the making of the game from making the art to the programming its self. The game I make will be open source so I will upload everything only when it is finished. The game being made will be the mystery game, which still doesn’t have a name so please if anyone has any suggestions please say so. I do hope you enjoy the series. The first part will be fairly small and be mainly about the planning and designing of the game, after that I will start on the art and everything will be uploaded for everyone to see! Thanks for reading! Ok im cracking on with the demo of Dead Lep Revenge but before I release it I would like it to be tested! I don’t really want it to be played by anyone and everyone so only a few people will be able to test the demo for me! This is where the competition comes in! 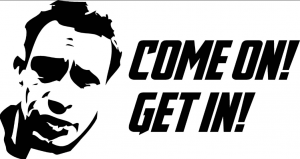 I will award only two people the chance to beta test the demo. I thought long and hard about what the competition should be and to make it fair its going to be a question, but before I tell you what it is I must tell you that all the answers are to be sent to development@peripheralgames.net and the winner will be picked at random. Ok the question is: What is our game(Dead Lep Revenge) called? Good luck and I hope you do well!